This weekend has been the Great Backyard Bird Count sponsored by the Audubon Society and the Cornell Lab of Ornithology and I've been making bird observations around my feeder and the waters along the Indian River. The count got off to a slow start on Friday; it seemed all the birds "flew the coop". But things picked up on Saturday and then Sunday morning was spectacular, despite the rain. Between 7 and noon Sunday morning I identified 25 species of birds - from the tiny brown-headed nuthatch to the American bald eagle. The morning got off to a strong start when I spotted a red-tailed hawk swoop into one of the loblolly pines with its breakfast in its talons. Meanwhile, the bird feeder had steady traffic of cardinals, chickadees, white-throated sparrows, house finches, and a persistent red-bellied woodpecker. 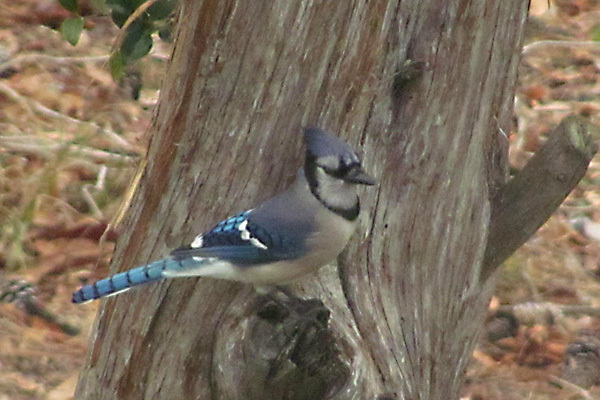 Also hanging around were blue jays and yellow-rumped warblers. Out on the river, there were floats of bufflehead and hooder merganser ducks taking turns diving for small fish and other subaquatic prey. There were also a few mallards and two canada geese that seem to be setting up housekeeping across the channel. Out on a dock were some ring-billed gulls and a cormorant. Then a large hawk flew overhead, dark chested with white speckles; I wasn't sure what it was so I broke open the bird book and identified it as a 2nd year bald eagle; having not yet developed the classic white head. I knew there were more bird species that frequent the area, so I kept watching after breakfast. Spotted a crow and a turkey vulture. Then a mockingbird braved the rain to sit atop one of the young live oaks in the area. Then it seemed it was time for the second wave. The lawn was besieged by a flock of robins - with a couple of European starlings intermixed. Some tiny brown-headed nuthatches and several red-winged blackbirds joined the rotation at the bird feeder. A carolina wren hopped past and then a beautiful northern flicker woodpecker landed in the tree. And to the overall list a great black-backed gull from Friday, a brown pelican from yesterday and a pileated woodpecker that I spotted during our Walk in the Park, also yesterday, and the total species cound for the weekend is 28. I still haven't spotted any herons, egrets, or kingfishers, but overall a great count. Never been to Indian River Park? Interested in seeing where it is and what's happening in the park? Join us this Saturday, February 18th from 10 am to noon to explore Indian River Park. We'll meet at the park entrance at Rokeby Ave and Main St. (Rokeby may still be closed south of Military for maintenance so follow the detour from Sparrow Rd to Main St to Rokeby). We will take a walk through the park and see some of the impressive old trees in the park, the Indian River's stream and flood plain, the bike trails, and perhaps some birds. I'll also point out some of the invasive plants and other areas for improvement. The round trip walk will be about 1.5 miles. I joined the Eastern Virginia Mountain Bike Association (EVMA) Southside chapter for another cleanup and trail day at Indian River Park on Saturday morning. The EVMA adopted Indian River Park and holds frequent events to maintain the trails and keep up the park in general. The events are coordinated with the City but are accomplished with all volunteer effort. The threatening weather dampened the turnout today but not the spirits of the team. The community also seems to be on a PR roll - another reporter from the Virginia Pilot was at the park to interview the volunteers before the cleanup got underway; we may see another article in the Clipper soon. Armed with wheel barrows, rakes, shovels, and a hefty supply of trash bags provided by the city, the crew fanned out around the park. While one team worked on repairing a curved berm on one trail, Mike Buff, the event coordinator, and I worked our way along the Indian River's stream bank collecting trash. We discussed the flooding that inundates some trails caused by toppled trees further downstream on the other side of Military Highway; the City's Public Works department is investigating. We also talked about keeping a healthy stream "connected" to its flood plain, which is an important factor in reducing storm runoff into the tidal Indian River and the Chesapeake Bay in general. Another topic was the creeping encroachment of invasive English Ivy. I was happy to discover the progress that was made on the stream crossing just off the park entrance. The EVMA has replaced the improvised string of loading pallets that bridged the gully with a neat path of split logs. And local Boy Scout Troop 6 is raising funds to build a full hiker/biker bridge on the trail. Overall the EVMA team removed a stack of old loading pallets, a wrecked tent, a pair of broken patio chairs, and six big bags of trash - mainly bottles and cans washed downstream from the surrounding streets. Then they re-painted several bridges and entry sign to the park. They topped off their efforts with a mini-picnic with burgers and hot dogs as they proudly considered their work and discussed opportunities for further enhancements to the BMX trails. We had a great first meeting of the Friends of Indian River last night. Sixteen neighbors from points up and down the river gathered at the library to share their stories and their interests. Long time residents remembered how the river was once much clearer, and then became much muddier as development swept through the upper watershed in the 70's and 80's. The attendees expressed great interest in doing good for the community, and hoping to get improvements for the community in return. Areas of interest identified by the group included the state of the business district along Indian River Road - especially the empty supermarket in Indian River Shopping Center; the state of the river, its grasses and oysters; the over abundance of non-migrating Canada Geese and their negative impact on the environment; and the impact of wakes from fast moving boats. We discussed the Indian River Park, piecing together stories of its acquisition from the city of Norfolk, and the work done by the local chapter of the Eastern Virginia Mountainbike Association (EVMA) in keeping the park accessible. We talked about the possibilities of locating a canoe/kayak launch site somewhere along the river. Several members expressed interest in doing outreach and education in the community. The consensus was that we should work with the city and other organizations like the Norfolk Highlands Civic League, EVMA, Chesapeake Master Gardeners, Elizabeth River Project, Chesapeake Bay Foundation, and even local Scout groups to improve the community. By getting organized we can use our numbers - and our connections - to take action, get attention, influence, and results. The group agreed to meet again in early March to continue organizing and planning. The date is TBD until we nail down a meeting room. In the meantime we'll share more information by e-mail and organize a "Walk in the Park" to explore some of the high points, and some of the low points, of the park. We'll also look into coordinating with the Chesapeake Environmental Improvement Council to see if we can help tree planting efforts on Arbor Day, March 31st.